The first definitive letter-postage Greenland stamps were issued in 1938. Before 1938, there was little need for letter-postage stamps in Greenland, as letter-mail within Greenland and between Denmark and Greenland was sent free-of-charge. 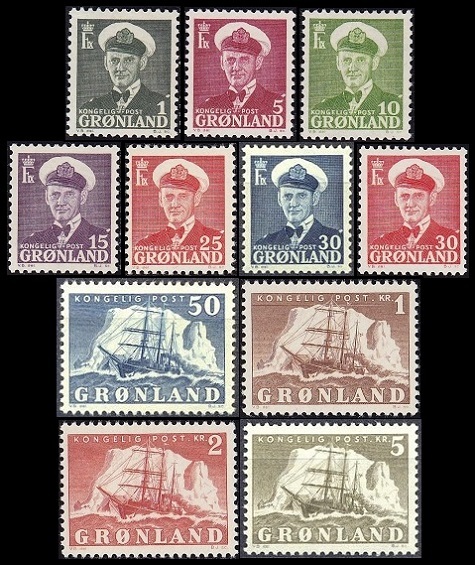 Seven of the nine portrait and pictorial definitive Greenland stamps shown above were issued on November 1, 1938. The 20 Øre and 40 Øre denomination stamps were issued on August 1, 1946. 01 Ø. - 20 Ø. (Sc. #1-6) - King Christian X. 30 Ø. - 01 K. (Sc. #7-9) - Polar Bear. Greenland had previously been a highly protected and isolated country under Danish rule, but that all changed during 1940. Greenland's connection to Denmark was severed on April 9, 1940, when Denmark surrendered to and was occupied by Germany. On April 8, 1941, the United States occupied Greenland to prevent a possible German invasion, and it remained under American control until 1945. 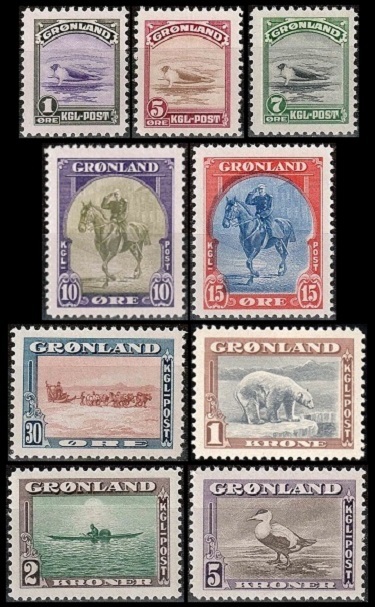 The nine new pictorial definitive Greenland stamps shown above were issued on February 1, 1945. These stamps are referred to by Greenland philatelists as the American Issue of Greenland. By 1943, with Greenland being cut-off from Denmark during World War II, it appeared that the postal administration would run out of definitive postage stamps. During 1944, the Greenland Delegation in New York City contracted with the American Banknote Co. to design and print new definitive postage stamps. The American Banknote Co. produced 100,000 sets of these stamps, and they were delivered to the Greenland Delegation in early 1945. They were placed on sale in Greenland on February 1, 1945. These stamps were only in use for a short period of time, before they were replaced by new stamps produced in Denmark, thus they are very scarce today. 01 Ø. - 07 Ø. (Sc. #10-12) - Harp Seal on an Ice Flow. 10 Ø. - 15 Ø. (Sc. #13-14) - King Christian X on Horseback. 30 Ø. (Sc. #15) - Sled and Dog Team. 01 K. (Sc. #16) - Polar Bear. 02 K. (Sc. #17) - Kayaker. 05 K. (Sc. #18) - Eider Duck. Here is a great article about these stamps that I found while researching them on the internet. King Christian X of Denmark had been very ill since 1942, resulting from a fall with his horse, and he died on April 20, 1947. He was succeeded by his oldest son as King Frederick IX. Of course, the accession of a new monarch would require that new definitive postage stamps be prepared and issued for Greenland. 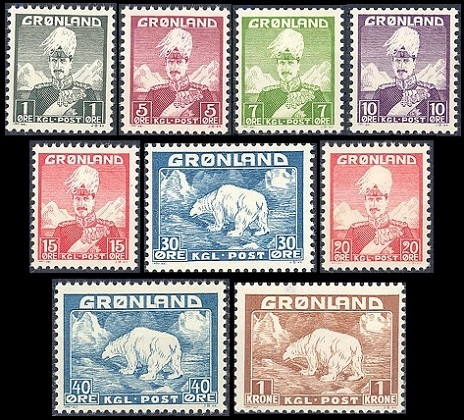 The eleven portrait and pictorial definitive Greenland stamps shown above were issued between 1950 and 1960. 01 Ø. - 30 Ø. (Sc. #28-34) - King Frederick IX. 50 Ø. - 05 K. (Sc. #35-38) - 19th. Century Polar Ship, "Gustav Holm". The two re-valued stamps shown above were issued on March 8, 1956. 60 Ø. on 40 Ø. (Sc. #39) - Polar Bear. 60 Ø. on 01 K. (Sc. #40) - Polar Bear. Though relatively common in used condition, they are a bit expensive in mint condition. 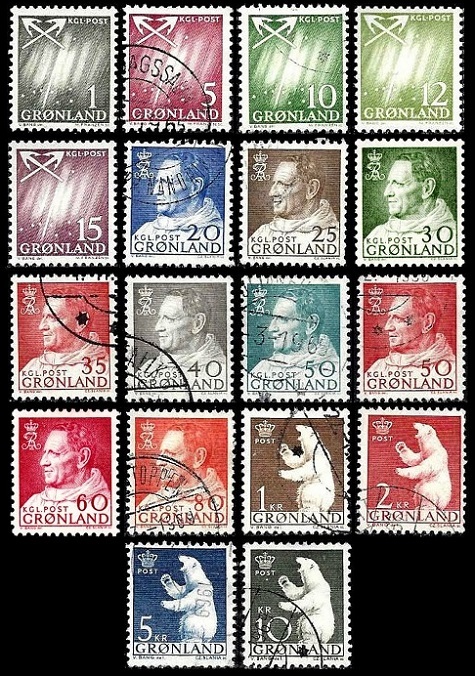 The eighteen new definitive Greenland stamps shown above were issued between 1963 and 1968. 01 Ø. - 15 Ø. (Sc. #48-52) - Northern Lights and Crossed Anchors. 20 Ø. - 80 Ø. (Sc. #53-61) - King Frederick IX. 01 K. - 10 K. (Sc. #62-65) - Polar Bear.